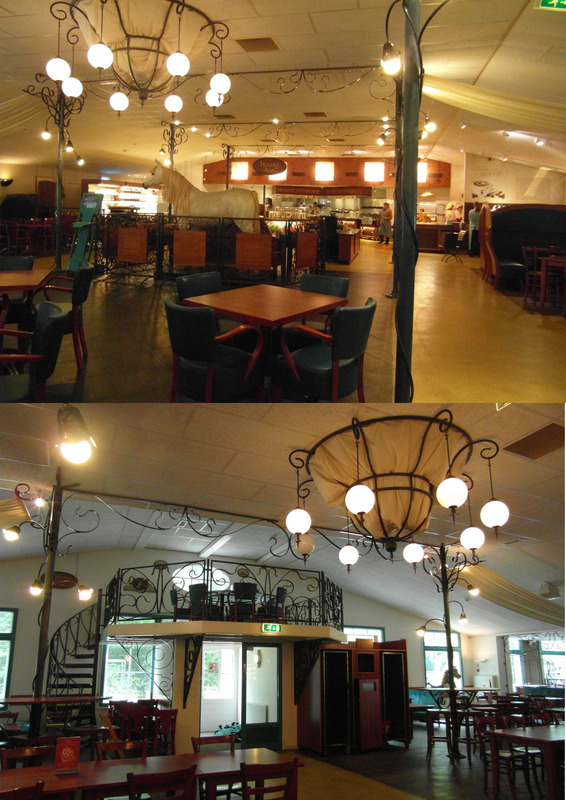 The White Horse restaurant was recently renovated, and Efteling have posted a little ‘making of’ video to show the transition. They have also created a story to go with the new theming of the restaurant. We’d like to say thank you to our friend Milena for providing a translation of the story. You can read it on her website here in both Dutch and English, and we’ve also included it in English below. There was once a poor work horse that spent its days with a mean old farmer. The horse stood lonely and alone in a damp shed. Its fur was grey and drab. “Oh if I only had a little friend” the horse thought often. One day the farmer harnessed him to the plough. The ground was hard and progress was difficult. “Faster, you lazy thing!” the farmer who whipped him ranted. “Work! Until you drop!” Suddenly a coach drove past. It had little children in it who were singing cheerful songs. But the horse was especially interested in the strange black stallion who pulled the carriage. Its long tail shone blue-green in the morning sun. “What are you staring at old nag?” shouted the farmer. “Get!” The whip cracked again while the coach disappeared from view. That evening there sat a peacock on the roof of the shed. He put his head through a hole in the roof. “Oh you saw that?” the horse asked with some surprise. “But where would I go?” asked the horse. “Then everything will be all right” The next minute he disappeared. The horse decided that the peacock was right. The misery had lasted long enough. The next day was a Sunday. The horse knew that the farmer always went away on that day although he did not know where. But this was the best time to escape. With a savage kick the horse kicked the shed door out of its hinges. He trotted into the forest and enjoyed his freedom. But after a little while he grew tired and hungry. Suddenly the peacock appeared again. ”Hold on!” the bird shouted cheerfully. “You are going the right way”. And he was gone again. The horse walked on, deeper and deeper into the forest. But his courage was sinking into his hooves. The next day the peacock crossed paths with him again. ”Hold on! You are on the right track” Again the bird vanished into the forest. The horse just about saw a glimpse of its beautiful tail. He was suddenly reminded of the stallion that had the brilliant tail, the one who pulled the carriage. Also in the following days the peacock came for a moment and kept telling him to hold on. But the poor horse couldn’t. He had been dragging himself along for too long without food or drink. On the morning of the seventh day the peacock again stood before him. “Oh no” The horse shouted angrily. But the peacock said happily: “Not this time because you are there.” And sure enough, the very next moment he came to a sunny spot. There stood a stately white house with peculiar vases on the roof. Through the open doors happy voices sounded and on the terrace children were playing. They ran to him and patted him gently on his flanks. “He looks so dreadful” A girl said. “So thin and dirty” Then they let the horse eat off their plates and drink from their glasses. It tasted delicious. The host of the teahouse came outside. “Now, now you’re a sight old boy! We will give you a thorough makeover.” As soon as the horse had eaten his fill the children started on him with buckets of soap. They scrubbed and brushed his fur, washed and combed his mane and kept hugging him. The work horse felt like a luxurious horse and was enjoying it very much. “What a nice nag you’ve got there, host! It’s very different from the ugly beast that ran away from me last week. Well… its best days were behind it anyway!” Relieved the horse turned its head. Then he saw his reflection in a big shiny vase. But it wasn’t a drab, grey horse that he saw. No, there stood a splendid white horse straight and proud. It gave him a warm proud feeling. The host took him outside. “Well if you don’t belong to anyone then you will just have to live here. And from now on my establishment will be called ‘The White Horse’! “You see don’t you?” said the peacock to the horse a little while later. ”Yes certainly, thanks to you” The horse answered happily. “If you say so” the peacock laughed. And before his eyes the bird turned into the blue tailed stallion. The white horse was speechless. “If you will be living here from now on, we could be friends.” said the other horse. It has been closed for a little while to be given a makeover, and now it is open once again! 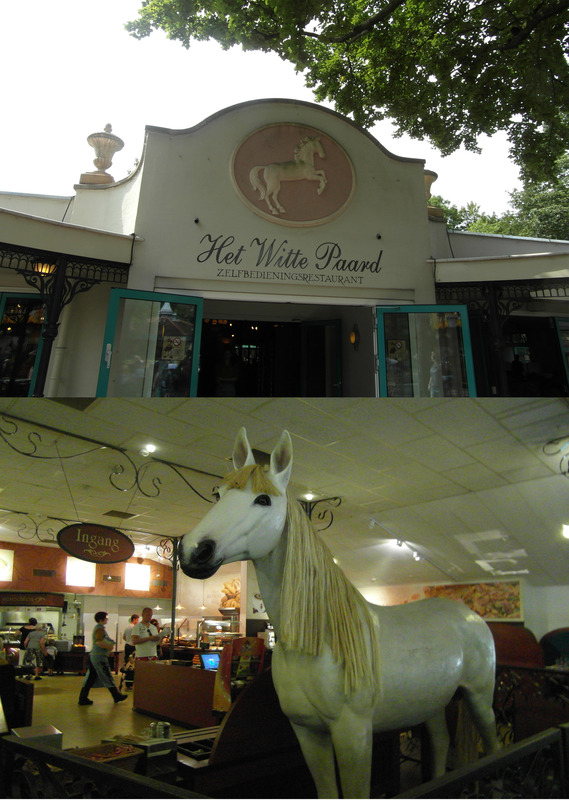 The White Horse (Het Witte Paard) has been transformed to give the feel of a tea room; very classy! There are teapots, plates and elaborate decor everywhere! It is definitely an improvement on before, theming-wise, and is even brighter and looks more spacious than before as well. Click here for a LOT more photos by our friend Eftelwesley, plus a few more.